Has Pakistan lost it’s International support? At least 3 million people in the Sindh province are still in urgent need of help but nobody is there to listen to these people who are mostly farmers and villagers. First it was the government of Pakistan that did not listen to them but now it appears that the world too has lost interest in them. The reason is quite simple! They say that Pakistan harbours terrorists by the world’s money. The world leaders have urged that whatever money that is given to the government either goes in waste or in the wrong hands. Since May 2, after the killing of Osama bin Laden in Pakistan’s Abbottabad just 71.4 kilometres away from the capital Islamabad. Many countries have suggested that Islamabad can not be trusted anymore, they have lashed out at Pakistan telling the world that all the funds are going to the Afghan Taliban, the Haqqani network and other terrorist organization that they say the Pakistan’s powerful spy agency Inter-Service Intelligence may have a hand in supporting them. This is truly sad indeed but it is the reality, the world’s response about the recent flood in the country as been negligible. As shocking and wierd it gets, no Muslim nation has come forward to help Pakistan during its difficult times. Iran is the only Muslim country that announced $10 million aid for the flood victims. There had been no response from the “Best Friend” of Pakistan that is Saudi Arabia, who last year too helped the country only when the world criticized it’s silence. There is no doubt in it that Sindh is under severe threat from diseases but things could get even worse as winter season is just weeks away. The United Nation had made an appeal of $357 million in emergency funding to shore up the rescue and relief efforts for the millions of affected people but that has fallen flat. China announced the $4.7 million aid for the flood victims. Iran has also announced the $10 million aid for the flood victims. Japan has announced 35 million yen for them. ← DEVELOPING STORY: Powerful Earthquake in Turkey! 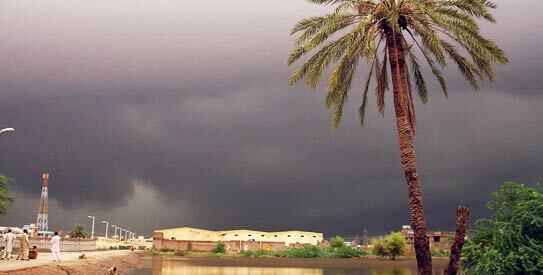 Abnormal monsoon and winter conditions which creates heavy downpours in upper pakistan including balochistan and then some parts of interior sindh are giving a big opportunity to pakistan government for asking for beg. The more rains in upper pakistan, the more beg government will get…. A near cyclone has already crossed the coast of Bangladesh/Myanmar last week. Most models predict above normal rains for this year’s NEM. Renowned model – GFS is predicting two cyclone in either seas surrounding Indian peninsula. One each in Arabian Sea and Bay of Bengal. Hope this cyclone does not flood the areas recently affected by floods. Thanks Pradeep for your views.